The other day, I randomly texted a friend who consistently goes out of her way to bless other people. It was a lengthy text, in which I told her how much I appreciated her, and saw the love of Jesus shining through her. I have learned the hard way, how it can feel like a punch in the gut, when it’s too late to tell someone how you feel. I have stood over too many caskets, at too many graveside services, and beside too many hospital beds regretting that I hadn’t said more. We always think we’ll have more time, but if you’ve ever lost someone tragically, out of the blue, you know that we don’t always have that luxury. I don’t want to wait until tomorrow to say what needs to be said today. What words do you need to say? Find the strength to say them, today. Let someone know you love them, now. Stand up for what you believe in, now. Speak your dreams aloud, now. 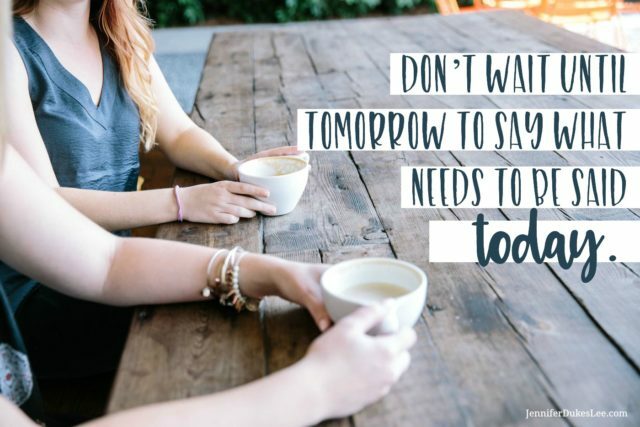 Take the challenge: Don’t wait until tomorrow to say what needs to be said today.